Thread: Built internals on B8 4.2L V8 + boost? I havn't seen anyone pull significant gains from this motor at all. 600hp seems impossible. Everything is super expensive just to keep running stock. I'm thinking the money just isn't worth it. But then I started to follow this guy in New Jersey swap his 4.2L for 4.0TT. I thought that project will cost more than building 4.2L. If I were to build the engine ( forged rods, pistons & cam) and possibly bore/stroke/port and sleeve. I don't have the money to do this, but if I did. JHM supercharger with near max output. I know we aren't talking about a 2JZ, but what are thoughts. Or could I just make another attempt at twin turbo. Tavarish on you tube fabricates turbo kit on Lambo, gives me so much hope. Spend the crazy money on engine management system and locate a tuner. The b8.5 3.0L V6 is built for boost. How much different is the actual engine from from the 4.2l? I would assume it's just internally forged and reinforced with 2 cylinders chopped off. A simple tune can gain nearly 100hp without changing anything mechanically. I'm done rambling. Let me know what you guys think. Anyone else? Preferably not reiterating. I guess I just don't understand why? Too me engineering is a science. Make a pump move air fast. Power to weight ratios. Tolerences for the engine are the limit to its power output. If you just said it would cost too much money to accomplish a built engine, I'd understand better why no one is doing it. Durability to heat and friction, weight, and space/area. These things make sense to me. Auto makers aren't stupid. I'm sure if they wanted to make a 1000hp Audi they could. Price, reliability and demand for such a product are reasons they don't. I don't believe its impossible. American muscle may be the smarter option financially. If money wasn't an issue what are these engines really capable of? Umm, have you guys been living under a rock lol? I know the OP (Qdubz) well, he's not the type to exaggerate a claim. In fact, he'll go conservative if anything. There's a company building a single turbo & they offer built blocks for 6k or so. its alot of money but you can do it on your own for less money all they do is build the top end of the block & they say itll handle 1000 whp easy. its on FB look on the "life beyond stage 2" forum on the 3.0T, & either the last or second to last they bring up the new whipple developed. find the company on facebook, & find the guy who has a manual shifter as his profile pic (i forgot his name) hes showing the progress on it. (& its very quick progres) theyre getting rid of the FSI, going full port injection, stock intake manifold, etc. its insane. i may be looking into selling my 3.0T car for the 4.2 & building it if they show results. 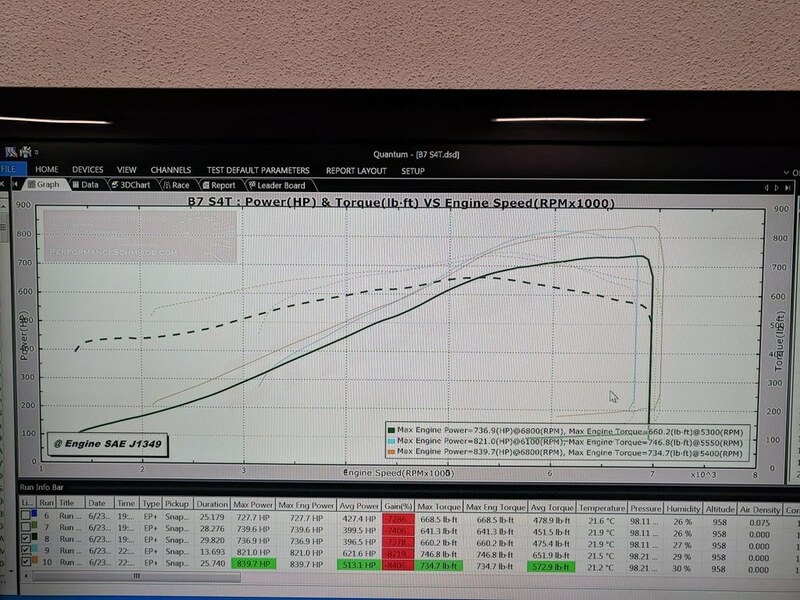 they do have RS4s running less than 5 seconds from 60-130 so they know what they're doing.